The Space Zone was a themed zone funded by the Science Foundation Ireland Discover programme. 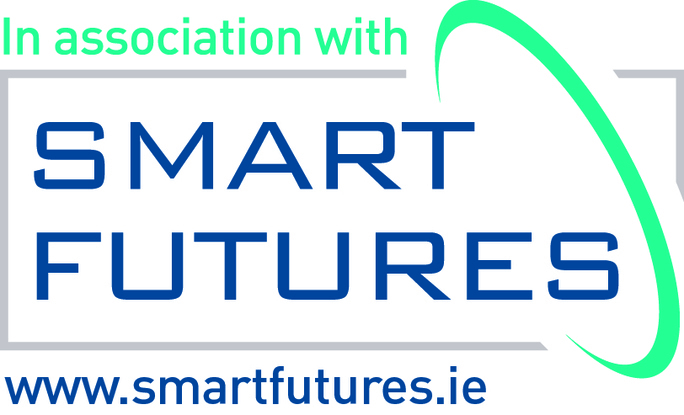 Ned is Director of the EurOcean Foundation working with satellites to study the oceans, Colin works at Airbus Defence and Space, Aisling and Laurence work for the European Space Agency and Niamh is a performer who promotes space science and engineering. 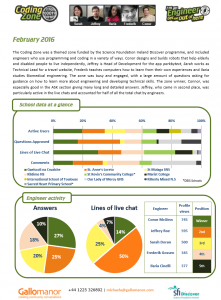 The zone had many busy live chats with most of the engineers engaging well with the students, discussing science and engineering as a career and the different routes they had taken to get into their current roles. 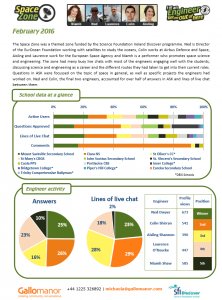 Questions in ASK were focussed on the topic of space in general, as well as specific projects the engineers had worked on. Ned and Colin, the final two engineers, accounted for over half of answers in ASK and lines of live chat between them. The Coding Zone was a themed zone funded by the Science Foundation Ireland Discover programme, and included engineers who use programming and coding in a variety of ways. Conor designs and builds robots that help elderly and disabled people to live independently, Jeffrey is Head of Development for the app parkbytext, Sarah works as Technical Lead for a travel website, Frederik teaches computers how to learn from their own experiences and Ilaria studies Biomedical engineering. The zone was busy and engaged, with a large amount of questions asking for guidance on how to learn more about engineering and developing technical skills. The zone winner, Conor, was especially good in the ASK section giving many long and detailed answers. Jeffrey, who came in second place, was particularly active in the live chats and accounted for half of all the total chat by engineers.